WGR 550: Buffalo Sabres goaltender Johan Larsson is day-to-day with an upper-body injury. Paul Hamilton: Sabres coach Phil Housley wouldn’t say if Larsson would be able to play tonight. Chris Ryan of NJ.com: New Jersey Devils forward Stefan Noesen has been out since January 8th with a lower-body injury, but it’s dating back to an offseason issue. He had been playing through it but they decided to shut him down for a couple weeks. He’s back practicing and could be back in the lineup soon. 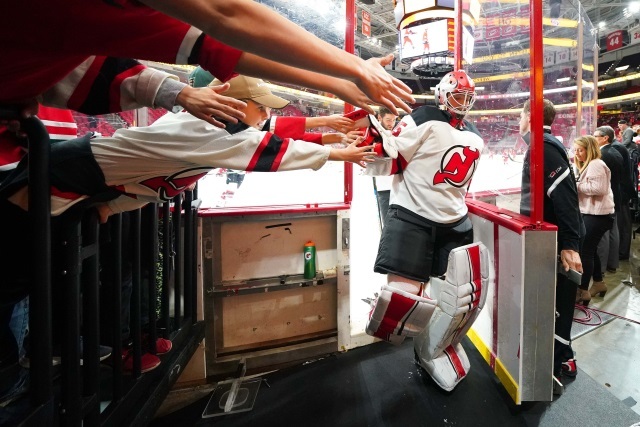 Goaltender Cory Schneider has finished his conditioning stint. Joey Anderson is back practicing with the team and could be ready to return to the lineup soon, either in the NHL or AHL. Joe Smith: Tampa Bay Lightning forward Braydon Point didn’t practice yesterday. He missed Saturday’s game with a lower-body injury. Coach Jon Cooper said he should be fine. Chris Kuc: Washington Capitals forward Lars Eller said he’s “getting closer” to returning from his lower-body injury. They will decide today if he’s able to go. Brian McNally: Capitals defenseman Christian Djoos is headed to the AHL on a conditioning stint. He’s been out since December 11th after having thigh surgery.